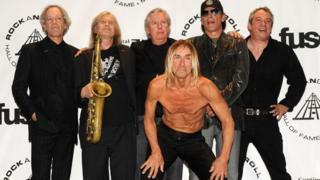 Steve Mackay, the saxophonist who appeared on The Stooges' 1970 album Fun House, has died aged 66. The musician, who had been touring with the group since their reformation in 2003, developed sepsis after undergoing surgery last month. "Steve was a classic '60s American guy, full of generosity and love for anyone he met," said singer Iggy Pop in a statement on Facebook. "Every time he put his sax to his lips and honked, he lightened my road." "He was a credit to his group and his generation. To know him was to love him." Like the rest of the Stooges, Mackay hailed from Michigan, and grew up inspired by jazz musicians such as Charlie Parker and John Coltrane. He met Iggy Pop at art school and, in his brief tenure with The Stooges, contributed memorable tenor saxophone parts to songs such as Fun House and 1970. Mackay left the band near the end of 1970, but appeared with them in concert throughout the years and rejoined officially during their 2003 reunion. He contributed to the comeback albums Ready to Die (2007) and The Weirdness (2013); and collaborated with acts including the Violent Femmes, Sonny Vincent Snakefinger and Commander Cody. Mackay is the third member of the Stooges to die in the past decade, following guitarist Ron Asheton and drummer Scott Asheton.